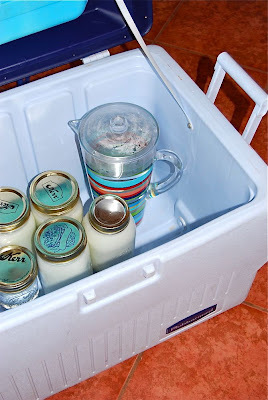 My sister, Haidi, was kind enough to pass along her method for making homemade yogurt to me. Since hers is the best I've ever had, it's only fair that I share it with you. All I ask is that you, in turn, pass it on to someone else. I started making yogurt when my youngest, now seven, started eating solids. 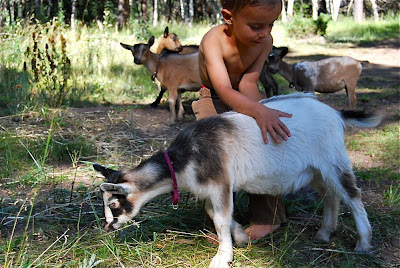 Feeling uncertain about the benefits of store-bought, pasteurized milk, I decided that the least I could do was give her something which I knew was beneficial for her developing digestive system. Cultured milk products contain “good bacteria” which help build a healthy immune system and aid digestion. Besides, I am not a milk drinker, but I do love yogurt. So anyway, my eldest ate yogurt. I’m happy to say that she still enjoys yogurt because I mixed everything you could think of into it. I should qualify that statement: everything healthy. She ate it with chopped sprouts, grated carrot and cucumber, brewer’s yeast, minced parsley, finely ground seeds and nuts - oh, fresh fruit as well. I have made yogurt countless times over the last few years, and I would say I have fine-tuned the process. I usually make a gallon, which lasts our family about two weeks. I have used all kinds of milk including raw cow and goat milk. My preference is for raw milk, but if that is not available, I try to use organic. If I find it on clearance, all the better - I bring it home and make a batch that day. In a large pot, slowly heat the milk to 180 F, stirring occasionally. Turn off the heat and allow to cool to 110 F. As the milk is cooling, I measure the starter (yogurt) into a bowl to allow it to warm a little. Wash 5 quart jars and lids and fill with hot tap water. There are many ways to incubate yogurt. I have used these two with good success. The first is a small down comforter which I put in my laundry basket and line with a dishtowel. The second is to use my camping cooler. You will no doubt come up with your own method which is most convenient for you. In the center of my incubator of choice, I place a couple of quarts of hot water (120 F) to help maintain the heat during the incubation process. So, the jars are ready, the incubator is ready, the starter is sitting out, and the milk is cooled to 110 F. Take a ladle-full of the milk and stir it gently into the starter. Now pour the starter into the pot of milk and stir again. 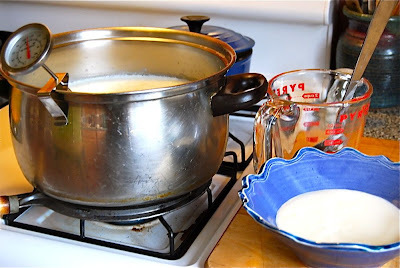 Empty the jars of hot water into the sink ( I use the water to wash my yogurt dishes) and pour the milk into the jars. Wipe clean, screw on lids, and place in incubator. The yogurt should be ready in six hours. If it still seems thin when you tilt the jars, leave for a couple more hours. The cooler the temperature of the incubator is, the longer it will take to set, which will also produce a tarter flavor. If you accidentally let your milk get too cool, just turn it back on and carefully bring it back to 110. If your yogurt doesn’t turn out perfect the first time, don’t be discouraged. It will still make great smoothies. Try a different brand of yogurt starter and see if that makes a difference. I have converted several friends to making their own yogurt when they saw how easy it is, and how much money it saves. Besides, it’s so much fresher than store bought. Homemade - it’s the best! * All photos by Haidi. Written by Haidi. I had a yogurt maker when the children were young and made 2-3 batches a week. Now, I'm the only one who eats plain yogurt -- and I wonder where that yogurt maker is?? My mom used to make yogurt back in the 70s and she had a little machine that sat on the counter. But I like just using what you've got on hand - like a comforter. I've been wanting to make my own yogurt for awhile, so thank you! Can this be flavored? At what point could you flavor it, and would fruit puree work? this is exactly how we make it at home and it always works. I like to get half od the batch and put it through a cheese strainer to make greek yogurt. My husband prefers runny yogurt. We'll all happy because making yogurt at home is cheap and efficient we always have plenty for everyone's taste. This sounds so good, and just being able to put some compote on it for a dessert would be even better if its homemade! I have never flavored the yogurt, but it would be fun to experiment with! Mixing sugar into the yogurt before it is cultured will affect the process, but I think you could successfully put a compote or puree at the bottom of the jars. Let us know how it works! I have two yogurt makers and I can't even remember the last time I used them! I've gotten so lazy and you are right, it really is so much better when you make it yourself. Wow I had no idea how to make my own yogurt...this sounds like fun! I have read that a yogurt made from previous batches will eventually weaken over time and lose it's ability to produce good yogurt. Have you come across this at all or do you always use yogurt from your last batch as a starter? Do you personally buy plain yogurt to use as your starter culture, and if so, what brand do you use? Ah! I've been wanting to make some homemade yogurt for a bit now but have found too many different methods to know which to follow... Since yours is tried and true, and so simple, I think I just might follow your direction in my yogurt-making efforts... Thanks for sharing. PS. I love your blog and am your newest follower! How do you store this and for how long is it good? Dairy make me sick, any alternatives/ideas? I've tried coconut yogurt, wonder if it would work? Cake Love and Vegetable Ardor.